Forza Horizon 4 Review | Nerd Much? 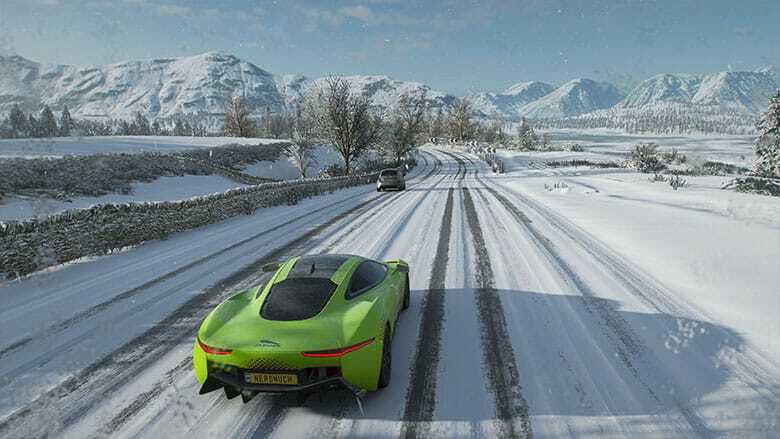 A review copy was provided for our Forza Horizon 4 review. It was Saturday morning, and I had just finished playing a four-hour Forza Horizon 4 session, and now it was time to take the family on our yearly obligatory apple-picking trip to one of our local orchards. As I was driving along the back country roads, with the foliage here already starting to change colors as it does in upstate New York this time of year, I couldn’t help but feel the deepest of urges to go offroading across the fields surrounding me – as I had just spent four hours doing in Playground & Turn 10’s virtual world. It’s a phenomenon known as the Tetris Effect – where you’ve spent so much time concentrating on a game that it begins to shape your thoughts and dreams in the real world, and no driving game makes you feel it as intensely as Forza Horizon 4 does. So, what makes Forza Horizon any better than any other racing game? In the simplest of terms, it’s the game’s fidelity – in both its visual and audio presentations – that makes the game feel so real while you’re playing it. Despite it’s more arcadey style of racing, FH4 provides its realism through its incredible visuals. Yes, that’s sort of a trope of the genre nowadays, with each racing game seemingly looking better than the next, but that doesn’t make it any less true here. Here, there’s no denying that Horizon 4 is a beautiful game, and for the most part it runs smoothly (aside from a few dropped frames here and there). Each season changes the environment, whether it’s the beautiful scenery of the hills of Astmoor, the tree-lined streets running through the Lakehurst Forest, or the iced-over Derwent lake, the game’s environment is awe-inspiring. Of course, it wouldn’t be a beautiful racing game without a plethora of beautiful cars to gawk at, and this game certainly has ’em. There’s virtually a car for any kind of driver – no matter what you’re into. Whether you’re more of a supercar enthusiast, a muscle man, a beach buggy lover, or a rare car hunter, Forza Horizon 4 has the car for you. In fact, there’s an overwhelming number of vehicles to find, unlock, or buy, and that’s what keeps me turning on my Xbox controller. Each car is beautifully brought to life, and video game cars have never looked as good as they do here. You can even see the fans spinning on the inside of a suped-up Ford GRC Fiesta with complete clarity. And then, there’s also the developer’s attention to detail, all-around. It’s enough to satisfy me that every car looks incredible, complete with shadows and lighting that react just right, but then, there are also nuanced details added to make the racing experience ultra-realistic. For one, you can feel the difference between the surfaces you’re racing on and other surfaces you’ll race on in your controller. You can not only feel the difference between driving on gravel and driving on snow, but you can also feel the difference between driving on snow versus driving on ice. We first felt these differences in Forza Horizon 3, but it’s even more pronounced here with Horizon 4. As far as the racing, itself, it definitely aligns more closely with arcade than sim, which is great for those looking for high octane thrills (which you’ll get immediately when you start the game’s opening sequence). After all, how realistic would it be to race a giant hovercraft down a mountain? Playground and Turn 10 serve a heavy heaping of blood pumping races and stunt challenges for thrill junkies here, and you’ll get no complaints from me on that front. There is a handful of preloaded difficulty options, and you can tweak each one further with custom adjustments to ensure that you never have to feel the agony of defeat (if that’s the type of player you are). 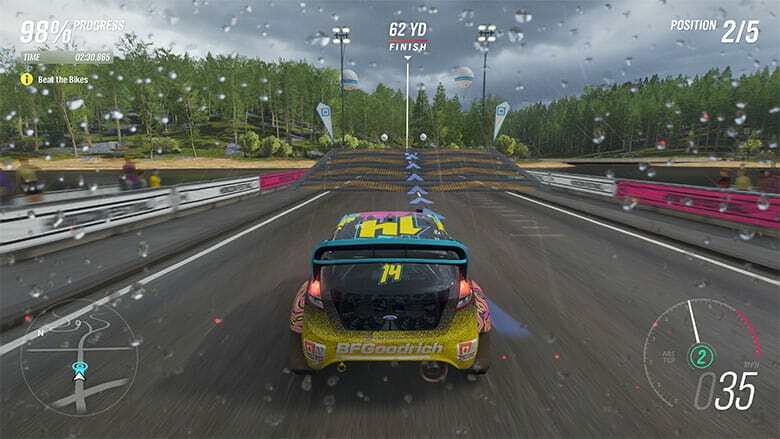 There’s also plenty for you to do in the game, whether you want cross country racing, street racing, stunt challenges, to play in the mud in a tiny Ford Focus, or find various billboards hidden around the map (bringing back the old Burnout Paradise vibes), you can – and so much more! And while there’s a seemingly neverending stream of new races and challenges to complete, my favorite thing to do in the game is to just drive off-road in various types of vehicles to see what happens. Some of the game’s best moments are hidden offroad while you’re doing 100+ without pavement in sight. In fact, probably the most fun I had was taking the McLaren Senna 2018 out onto a frozen body of water and just going to town. Thanks to the new seasons, every race and the open world feel fresh again every few hours when you’ve earned enough cred to see the season change. You’ll slip and slide all over the place during races in the spring on the same tracks that felt much more vanilla during the summer season. It’s likely that you won’t even notice much of a difference between Forza Horizon 3 and 4 when you’re driving in the summer, but when you’re driving in the winter snow or through a forest of orange and red trees, you’ll notice that what actually seems like a small change can change the game entirely. 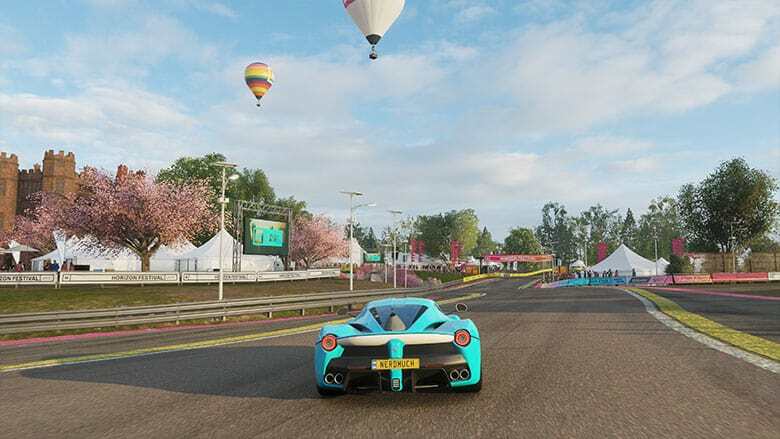 Where Forza Horizon 4 comes to a screeching halt, however, is with its excruciatingly long loading times and forced presentations before and after races. While long load times can be forgiven, given the fact that the game is set in a seamless open world, the inability to skip the fanservice (in this case, slow panning shots of whatever car you’re driving before the race) and forcing players to watch the slow process of rewarding of credits and fans without the option to skip is a headscratcher. I don’t need to see all of my credits and fans earned being displayed on a scoreboard, complete with menu animations and graphic splashes…I just need the points. It’s easily the most frustrating aspect of Forza Horizon 4, and hopefully, they’ll patch in a “press A to skip” option soon. You’re also getting a mixed bag when it comes to the game’s soundtrack. Sure, what’s there is good, with stations like Block Party playing Eric B & Rakim, A Tribe Called Quest, and Kendrick Lamar, and Horizon XS playing Foo Fighters, Greta Van Fleet, and the Killers. But the problem is that if you’re spending 50+ hours in-game, those songs get repetitive as hell. It’s a unique problem for racing games because music can really drive the experience (no pun intended), and when you’re hearing the same 20 songs over and over again on a radio station, it becomes a noticeable flaw. But overall, Forza Horizon 4’s positives are so overwhelmingly so that its negatives feel more like a minor scratch on the paint than a flat tire. 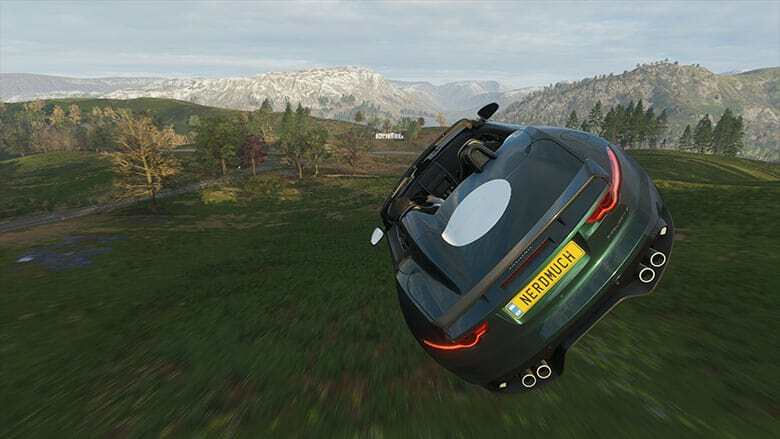 In fact, we’re crowning Forza Horizon 4 the pinnacle of racing games, thanks to its incredible visuals, exhilarating races, and well-designed, seamless open world. As it stands right now, you won’t find a better open world racing game than this.